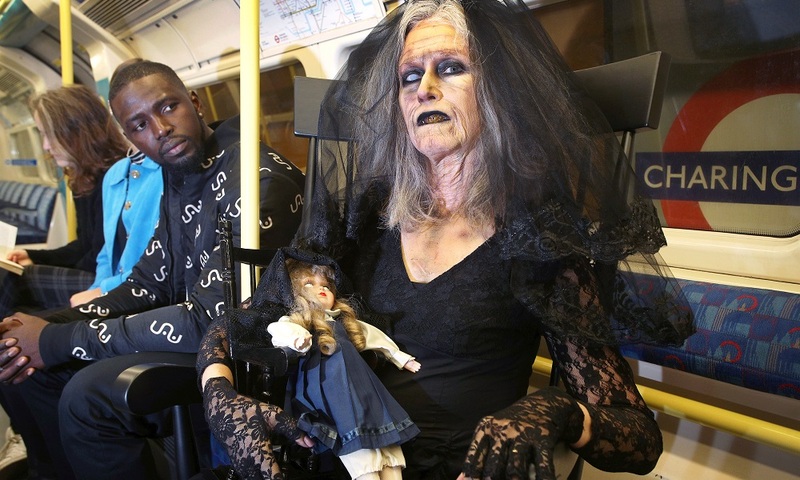 Creepy lady is unleashed to spook London commuters in promotion for Fanta’s Twisted Carnival Halloween attraction beginning today. 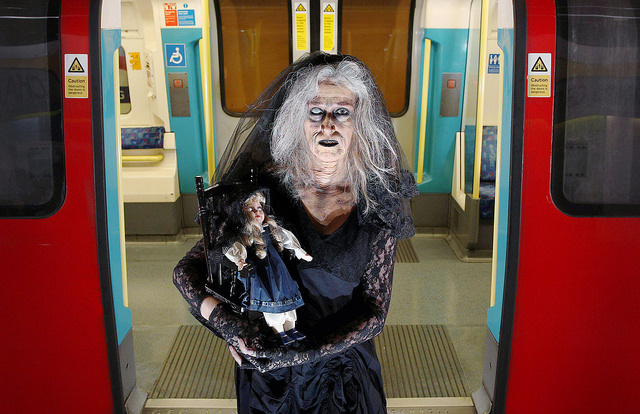 A ghoulish old lady was spotted in various commuter hotspots around London this morning, giving commuters a rush-hour shock on their way to work. 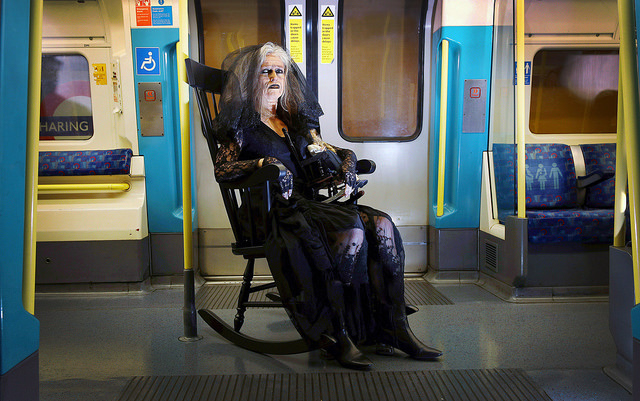 Office workers were stunned to witness the bizarre, spine-chilling scene of the sinister senior styled with prosthetic horror make up, riding the Jubilee Line train on a vintage rocking chair. 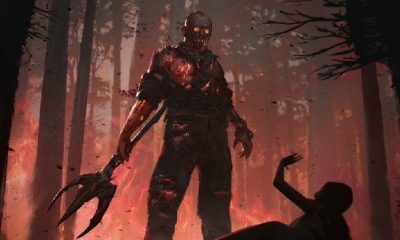 The ‘Ghoul’ character is set to feature in Fanta’s Twisted Carnival, a Halloween attraction that will be touring the country from Saturday 6th October. 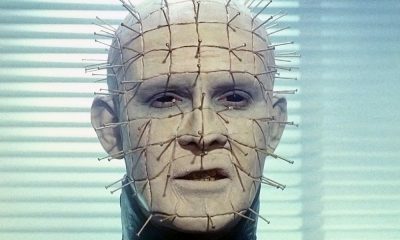 Visitors brave enough to visit the carnival will be challenged to explore five interactive exhibition rooms full of frights and delights. 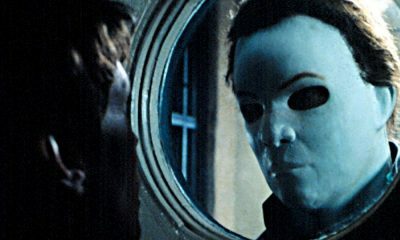 The ghoul was unleashed on the public by producers today to test reactions to her chilling prosthetic makeover ahead of the tour. Fanta’s Twisted Carnival, which features immersive theatre and illusions, will tour venues across the country including Thorpe Park, Westfield London, Birmingham’s Bullring & Grand Central and Liverpool One. 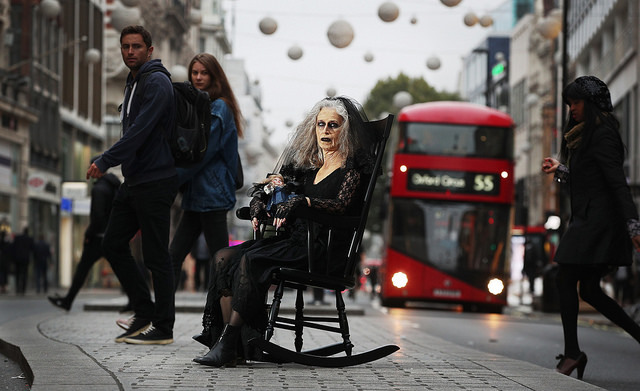 Commuters looked on in disbelief as she was spotted on the tube train, on Oxford Street and tourist hotspots across the capital. 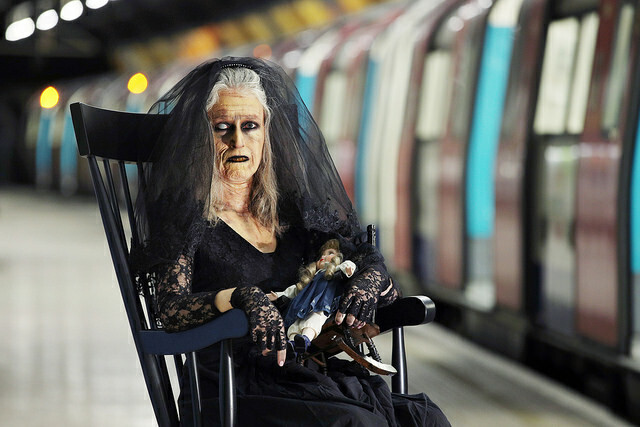 Eagle-eyed Londoners spotted the creepy lady cradling an equally eerie doll, also seated in a rocking chair. 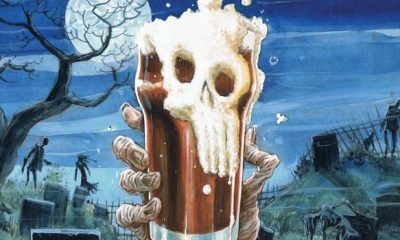 The Twisted Carnival coincides with the launch of Fanta’s two new Spooktacular flavours, created especially for Halloween, Blood Orange Zero and Pink Grapefruit Zero. 6th–7th October and 13th – 14th October: Thorpe Park, Chertsey. 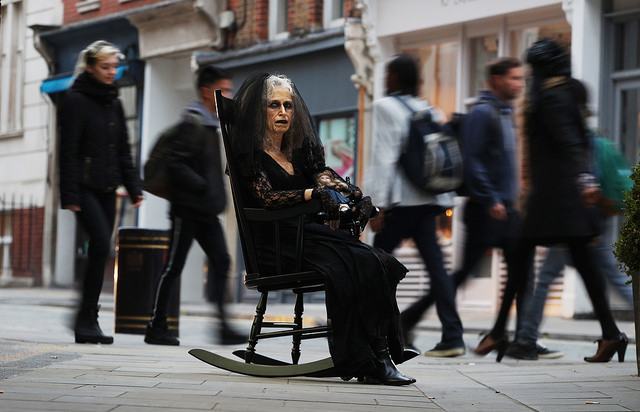 18th – 23rd October: Westfield, Shepherd’s Bush, London . 27th October – 1st November: Bullring, Birmingham . 3rd – 4th November: Liverpool One.